Two University of Adelaide alumni have been putting their civil and structural engineering skills towards helping Christchurch rebuild following the devastating earthquake of 22 February. University graduate and PhD student Lisa Moon arrived in Christchurch the day after the February earthquake, and still tenses up every time she passes through the cordons around the city's damaged CBD. Lisa is leading an international team of researchers documenting the city's brick and stone buildings and how they performed during the 6.3 magnitude quake. She says it's been a stressful and emotional time but an "amazing experience" and one she would not have missed. "Entering the CBD for the first time was very eerie," she says. "The only people about on the first few days were Urban Search and Rescue - sometimes with sniffer dogs, the police, the army and a few engineers on inspections, or VIPs who were touring the destruction. "There were helicopters flying overhead, alarms going off everywhere, lights still on in buildings, and even a radio playing in one shop. It was obvious that many people had just dropped everything and ran. "There were jackets and handbags in restaurants, food and glasses of wine on the tables, shops' doors open with merchandise thrown everywhere. Where there should have been cars and buses driving down the street there were tanks. Where the people should have been walking there were piles of rubble. This is not something I'll ever forget." Lisa graduated in 2005 with a double degree in Civil and Structural Engineering and Science, majoring in Physics. After graduating, she spent a year in Europe completing a Masters in Earthquake Engineering and then another two years in Auckland working for a consulting engineering company. Her PhD topic, started last July with supervisor Professor Mike Griffith, is on seismic assessment of unreinforced masonry buildings with timber floor diaphragms (floor or roof). It was going to be a theoretical thesis but will now have a large fieldwork component. "Christchurch has many beautiful historic brick and stone buildings, including the badly damaged Christchurch Cathedral," Lisa says. "Unlike newer concrete and steel buildings, the behaviour of unreinforced masonry buildings under earthquake loads is less well understood. But being older they tend not to be built to today's stringent building standards and many behave poorly in earthquakes." Lisa was in Christchurch last October to observe building damage from the September earthquake and again just before the February disaster to see additional damage from the Boxing Day aftershock. She was familiar with the buildings and believed she could help with the recovery effort. "It's important to collect as much data as possible before the city is cleaned up and to see what type of building or retrofit techniques worked well and what didn't work so well," she says. "The goal is to work out how the buildings behaved, and how that fits in with our current design models. "There are plenty of engineers out there ready to condemn brick buildings simply because they are brick, but this would result in the unnecessary destruction of much of our heritage." 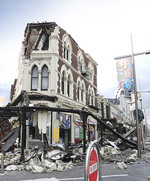 The global engineering community has its eye on Christchurch and lessons learned from this earthquake will be applicable not only in New Zealand and Australia, but throughout the world. "There's been a lot of discussion within the engineering community here regarding building codes and practices and what these earthquakes mean for the future. I've seen a number of international teams of engineers around Christchurch, including teams from the US and Europe. Actually being here and being part of the discussion has been fascinating," Lisa says. So what does the future hold for Christchurch? "It will be a huge job to fix Christchurch. Half the city's roads need to be repaired, much of the water and sewerage systems likewise, and of course there are many buildings that will need to be demolished or repaired. "There are a lot of decisions that will need to be made regarding which buildings to fix, how to rebuild, and what to do with the areas of the city worst hit by liquefaction. "It will also take a long time for people to rebuild their lives. There has been so much disruption over the past six months with people losing businesses, homes and loved ones - no-one is unaffected. And all the uncertainty about the future makes it difficult for people to move on. "But, saying that, Christchurch will recover. It will be a different place, but there are many dedicated people who are committed to rebuilding - it will just take a long time." Consulting Structural Engineer Peter McBean has spent much of his 25-year professional career designing new buildings that will not collapse during earthquakes. In Christchurch at the start of March, he observed in person for the first time the destructive power of a major earthquake. Peter was in Christchurch as one of two structural engineers of the Australian Urban Search and Rescue (USAR) Task Force, sent to assist in the disaster response. Their task force, arriving 10 days after the earthquake, relieved other USAR teams sent in the immediate aftermath. "The huge extent of damage was a lot to take in," says Peter. "Everywhere you looked − parapets, awnings, building facades and, in some cases, whole buildings − had fallen. Cars on the street were crushed flat by falling debris. "Added to that was the complete absence of people and life in what should have been a vibrant city centre. Walking down an empty street became a surreal experience, like being on a post-apocalyptic Hollywood movie set." Peter graduated with an Honours Degree in Civil Engineering in 1984. Since 1989 he's been a director of civil, structural and environmental consulting engineers Wallbridge & Gilbert. "Early in my career I developed an interest in structural dynamics and in particular how structures respond to earthquakes," says Peter. "About 10 years ago I became interested in our preparedness and response to earthquake events." Peter attended the first USAR course run for engineers in Australia in 2005. "USAR personnel are trained to find and rescue people trapped in collapsed and damaged structures," he says. "When you design buildings to resist earthquakes you focus on how the structures fail and their likely collapse mechanisms. "As an engineer with USAR, I assist in determining if the broken structure is safe to enter and, if not, what strategies may reduce the risk to rescuers. "This often means entering the structure to undertake the structural assessment ahead of the rest of your team. The work can be dangerous and cramped, but training reduces that to an acceptable level." Christchurch, although smaller than Adelaide, has similar architecture and lifestyle, and its buildings are constructed using similar techniques and methods. "I was therefore keen to go, not just to assist the people of Christchurch in whatever way I could, but also to observe and learn what had happened there to better prepare Adelaide for future earthquake events," Peter says. The February earthquake was very close to the city and resulted in severe ground motion throughout the CBD. "Modern buildings designed to current earthquake standards are believed to have experienced shaking more than twice that for which they were designed," Peter says. "It was only perhaps the relatively short duration of the earthquake that saved many further structures from collapse. "With the exception of a few notable examples, the majority of modern buildings performed quite well. What is encouraging is how well some of these buildings survived almost completely intact. "Well-configured buildings with regular geometry and good structural detailing consistently demonstrated excellent resilience. This suggests that modern design techniques are starting to get it right." However, older buildings, with poor structural systems and detailing, in particular unreinforced masonry buildings didn't fare so well. "These structures often suffered severe damage and many will require demolition," says Peter. "I also inspected a number of older structures that had in recent years been retrofitted with structural measures to improve their seismic performance," he says. "A number of these retrofit strategies proved very successful and more building owners should be encouraged to undertake similar improvements." 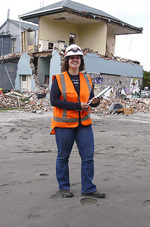 Civil and Structural Engineering PhD graduate Lisa Moon is assessing which buildings in Christchurch fared better when the earthquake struck. Peter McBean, pictured at far right, with fellow engineers Pat Slavich (left) and Professor John Wilson (centre).